Over the weekend I took the best girlfriend ever to the shores of Lake Pukaki for somemuch needed R&R and outdoor therapy. We nevertheless couldn’t help ourselves and had to look at South Canterbury’s boom town, the mighty Twizel. Apparently build as a transitional collection of dwellings for the workers involved in the building of the local hydro dam, its inhabitants fought against its distruction in 1983 and since its been, er, standing around in the emptyness of the southern McKenzie district. 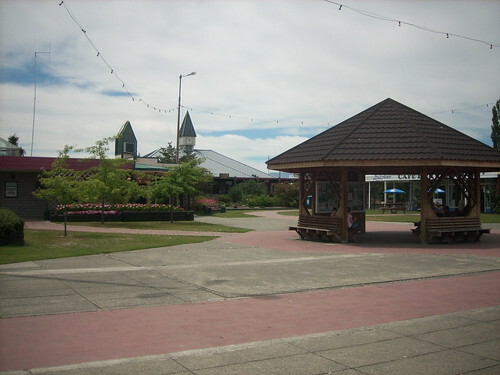 The planning was quite advanced for New Zealand villages: a central shopping area, with a circular road around it for the houses of the employees, all in the same 70’s weather board design. Driving through Twizel at night is like being stuck in a Stephen King novel, and while it does improve considerably during daylight hours, I find it hard to understand why the place has had a staggering increase in its real estate. According to the locals, folks from the few urban areas that New Zealand can boast with (Auckland, Christchurch and Dunedin) are flocking to this South Canterbury village to relaxe and unwind. Which just really shows again that down here at the end of the world, things are just a smidgen different from the rest of the world.